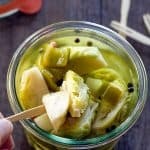 If you love Brussels Sprouts, you are going to really love Pickled Brussels Sprouts! Lightly spar boiled and preserved with garlic, rosemary, jalapeños, and peppercorns, these will add some love to your cheese board for sure! Trim the whole sprouts if not already done. Slice in half through the end. If they are large you might want to quarter them. Salt the water to taste. Blanch the sprouts for 3 minutes to par-cook them. Remove the sprouts from the boiling water and submerge in an ice bath to stop the cooking. Layer the sprouts, garlic cloves, peppercorns, and jalapeño peppers (sliced or chunked) in a glass jar for pickling. In a medium-large pan add the two kinds of kinds of vinegar, water, sugar, and salt. Carefully remove the pan from the heat and pour over the sprouts and spices. Seal the jar and store in the refrigerator for up to two weeks.